I have really been working to clean out my freezer. I have found a lot of interesting things in there. But my latest discovery was three bags of frozen blackberries. So I got down to business and made some Blackberry Sangria, a Pinot Noir-Blackberry Reduction sauce for some grilled pork tenderloin and these Lemon-Blackberry Muffins with Lemon Glaze. I always find blackberries a little tart so the lemon glaze goes a long way and so does the coarse sugar. Baking seems to be the best way to use up a lot of ingredients I have siting around. Needless to say, the oven has been going a lot. Here’s what you will need: All-purpose flour, quick-cooking rolled oats, brown sugar, lemon zest, lemon juice, baking powder, baking soda, salt, eggs, vegetable oil, vanilla extract, buttermilk, blackberries, coarse sugar and powdered sugar. In a large bowl, combine 2 cups flour, 1 cup quick cooking oats, 1 cup packed brown sugar, 1-1/2 teaspoons baking powder, 1 teaspoon baking soda and 1/2 teaspoon salt. Set aside. In another bowl, combine 2 eggs, 1-1/4 cups buttermilk, 1/3 cup vegetable oil, 1 Tablespoon lemon zest and 1 teaspoon vanilla. Mix well. Pour wet ingredients into the dry, mix slightly until combined. Fold in 3/4 cup blackberries. Spoon batter into paper lined muffin cups. 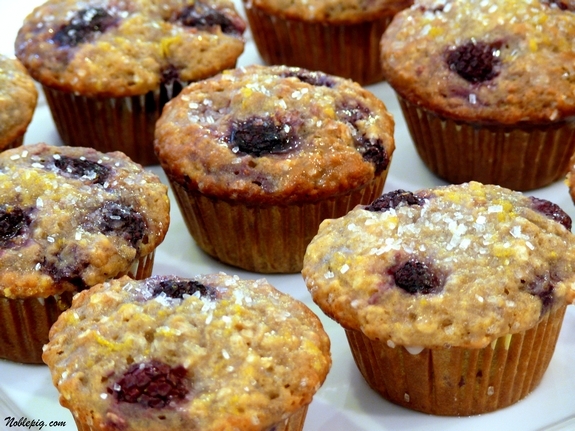 If you want blackberries on top, add a few extra to each muffin cup. Sprinkle with coarse sugar. Place in a 375 degree oven for 20-22 minutes or until a toothpick inserted into the middle comes out clean. Remove from the baking pan immediately and place on a wire rack. While the muffins are baking, make the lemon glaze. In a small bowl mix together 2/3 cup powdered sugar, 2 Tablespoons lemon juice and 1 teaspoon lemon zest. Pour all over the tops of cooled muffins. The glaze will meld into the muffin and you can add more coarse sugar if you choose. This is a nice way to start the day. And then, I got greedy. I schmeared lemon curd onto each bite and OMG, over the top. You have to try it. 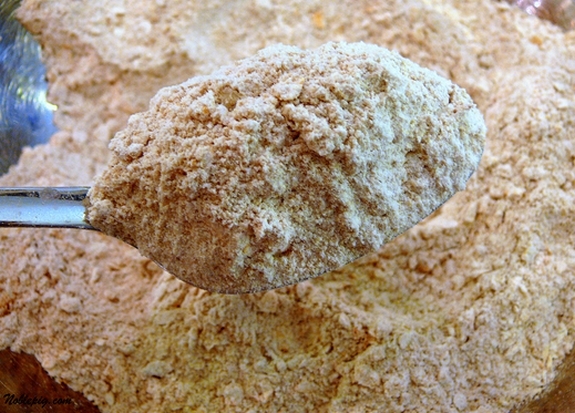 In a large bowl, flour, oats, brown sugar, baking powder, baking soda and salt. Set aside. In another bowl, combine eggs, buttermilk, vegetable oil, lemon zest and vanilla. Mix well. Pour wet ingredients into the dry, mix slightly until combined. Fold in blackberries. Spoon batter into paper lined muffin cups. 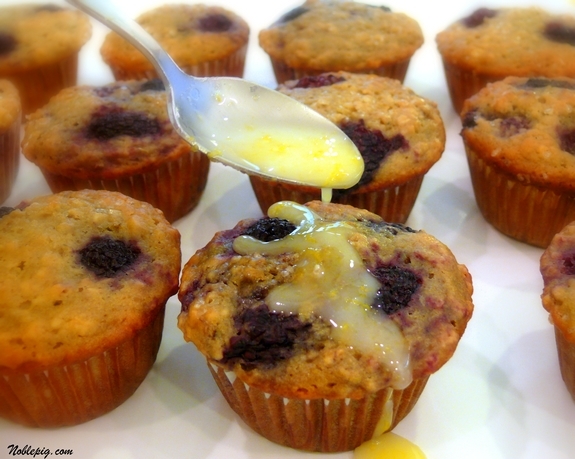 If you want blackberries on top, add a few extra to each muffin cup. Sprinkle with coarse sugar. Place in a 375 degree oven for 20-22 minutes or until a toothpick inserted into the middle comes out clean. Remove from the baking pan immediately and place on a wire rack. While the muffins are baking, make the lemon glaze. In a small bowl mix together powdered sugar, lemon juice and lemon zest. Pour all over the tops of cooled muffins. The glaze will meld into the muffin and you can add more coarse sugar if you choose. One Year Ago Today: Are There Any Left? mmmm! i’ll have to make these this weekend. they sound like they’d be delicious with blueberries. i might have to adapt it and use blueberries, if thats alright with you. I’m getting hungry just looking at these lip-smacking beauties Cathy. I wish I had berries of these sorts…looks like a super combination! I love muffins with oats inside! These look and sound so good, I’ll have to try it this weekend! I love blackberries! I wish I found some in my freezer! I love a good lemon drizzle. Those look great Cathy. I love the lemon glaze! Yum! You know that moment when you wait a few seconds for a picture to load and then when it loads you, it’s just BAM, instant pavlovian response and massive desire for the picture that has just appeared on your screen? No? Well, let’s just say I smacked in the face with that muffin photo and nearly tried to bite the screen my response was so lustily greedy. I love the recipe, particularly with the lemon. So let’s hear about that blackberry sangria and the tenderloin with the pinot-noir blackberry reduction. Sounds yummy. Those last several photos … OMG. I’ll definitely make these when we pick blackberries this summer. Like Rachel, I’d like to hear about the sangria and reduction sauce, too. Yum! 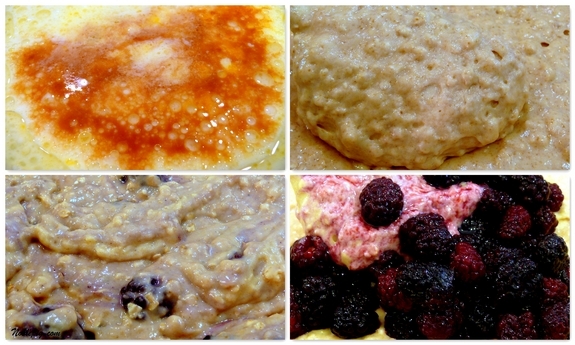 I love lemon curd and anyberries…these would not have lasted long around here…the glazed pork…yummmmmm. Did someone say lemon curd? I swear you could shmear lemon curd on sawdust and it would be great! And as always the muffins look fantastic! I like the coarse sugar on top too! Lemons and blackberries. Two of my favourite things! A friend of mine moved and gave me all her freezer stuff, including a big bag of blackberries. Thanks for the recipe! Love the glaze on top with the coarse sugar. Mmmm! I love blackberries! I’ll bet the added lemon makes them taste even better. I have so many bag of summer berries in my freezer year round. My son loves smoothies, so I need this a lot. It become handy when they are not in season. Such a delicious idea adding them for your muffins. Mmm…my boy would love those. He’s into berries of all kinds. I love blackberries and this is, indeed, a great way to use them. These look, and, I’m, sure taste wonderful. Blackberries are also wonderful with orange flavoring. Hummm! Your muffins look delicious! And, your freezer purge sounds more interesting than mine. I found some ribollita from months ago, and it’s too hot for soup today! Those look so good! I buy fresh blackberries at Trader Joe’s every week and normally just eat them in my yogurt with a banana. 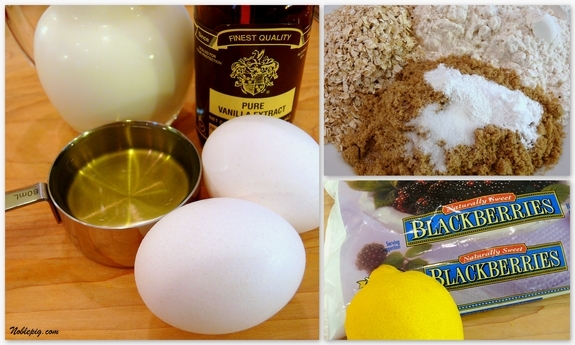 I never would have thought to bake with blackberries…And I bet the lemon on the top adds so much flavor. I’ll be trying these, soon! I wish I had one now. those look tasty , but I’m not a big blackberry fan. I tried a new muffin recipe I found the other day – for oatmeal /strawberry muffins. They were fabulous! So, so, so yum! I love everything about these muffins…Definitely a keeper! 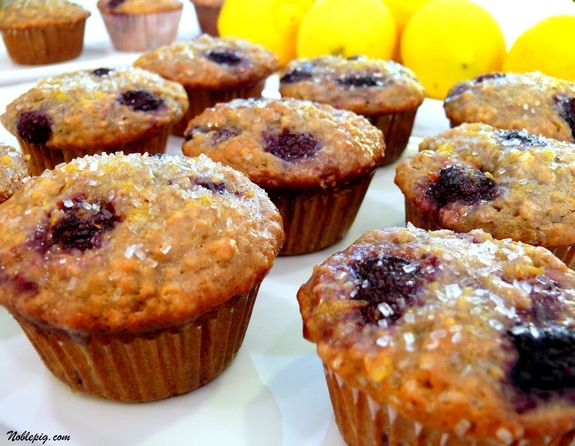 I could also eat lemon cud by the spoonful, I can imagine how it tastes on these muffins! Blackberries were always such a treat growing up, since they are rather expensive and my siblings and I would gobble them down. Even when I buy them today I still feel like it’s an extra special treat. The lemon curd paired with these sounds awesome!!! 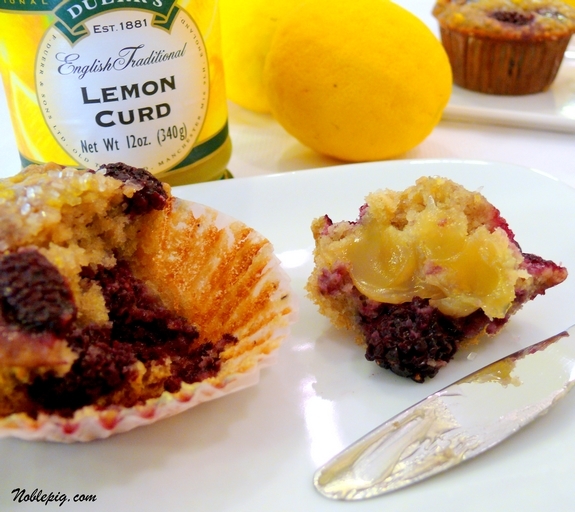 These look and sound so tasty – I love the shot of the lemon glaze being drizzled on the muffin…mouth watering! Thank you, I have about 5 bags of various frozen berries in my fridge. Muffins will do the trick. These look fabulous! 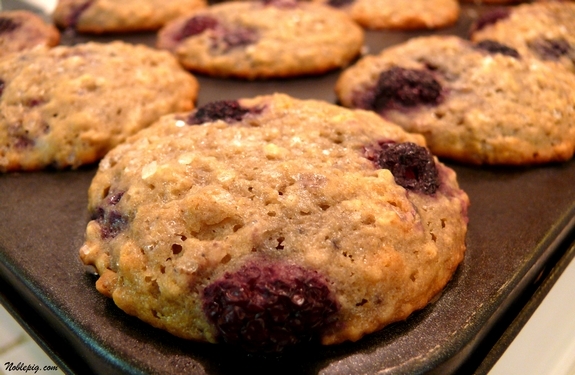 Wow – oatmeal, buttermilk and blackberries – these would stay moist forever. That is if they lasted that long around here. Ha. Twenty-one days and we’re heading “home” to Yachats, OR for a month. Can’t wait! There’ll be a sharp increase in berry sales from that point on. Have you ever made your own lemon curd? You’d love it. Especially with these muffins! I can’t believe with all this packing you still find time to bake, cook, etc. I end up at McDonald’s a lot when I’m packing to move!! You rock! Those muffins sound great, but Pinot Noir blackberry reduction for grilled pork?! That sounds wicked good. These muffins look outstanding. This is my first visit and I’m taking time to read more of your posts. We need to start putting coarse sugar on top of everything. Absolutely delicious. Love all the flavors here. I have a freezer full of berries I picked and froze last year. We did use quite a few, I made a lot of jam from them, but still have packages of blueberries, strawberries and raspberries left. These muffins should hit the spot and with the lemon curd, make for a good summer dessert or breakfast. Do you think they will freeze well ? Can we have the blackberry sangria recipe next? How divine! But I’d have to get up v. early to start the day with them–they’d never last ’til the next day. Oh, yum! 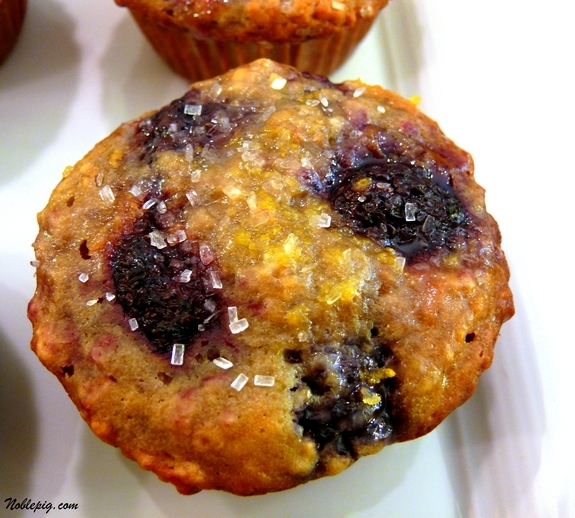 I’ve never had blackberry muffins before, a must try for sure! 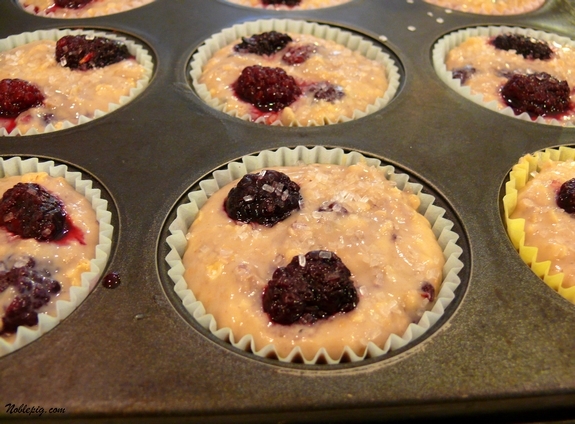 yes, the muffins are lovely–big ol’ blackberries are so photogenic. however, what has me smitten is the glaze with its huge hunks of zest–just delightful! Yummy-and the perfect time of the year for them. Okay, the muffins look fine, but tease me with the Blackberry Sangria and don’t post a recipe? What’s up with that!? I can’t stop starring at the last pic! Looks so mouth-watering! What a lucky find! Makes me want to go poking around in my freezer…. I know everyone’s talking about the berries, colors and lemon, but I think your most brillant choice was the final touch of the coarse sugar. It really makes them sparkle. Sometimes your food looks so good I wonder if it’s legal. YUMMY! I love finding things in the freezer that I forgot about! Your muffins look delicious, and the lemon curd mmmmmm!!! Coarse sugar. ALWAYS the best option. Want it on my cereal even. i have two huge bags og cherries sitting in my freezer that i just pitted. i hope i don’t forget about them. I was already thinking these looked like heaven…and then I saw all the lemony goodness. Do you happen to have the recipe for the Pinot Noir-Blackberry Reduction sauce? Sounds awesome and I have blackberries doing nothing right now. Oh I bet the lemon curd was heavenly. 3 bags of frozen berries would be a big treat here–I am down to my last 3 blueberries from last season. Strawberries are great raw of course but not very good for baking–I am so ready for berry season! Every bite? Ha! Gotta love that. I’ve been wanting muffins again. Yhese look super! Perfect to make on busy moving days. Good luck!!! you gotta love when you hit the gold mince in the freezer!!! Sorry I haven’t checked in lately … look at what all I missed too. That PODS thing would make me excited and want to throw up all at the same time. Must make those muffins! And looking at your previous posts … HAVE TO make those chocolate chip cookies. For the record … Rachael Ray’s magazine is the one I get the most use out of. I get a ton of cooking magazines, but hers is the one I can count on for every day, weekly meals. She’s brilliant! Now, why did you not post the recipe for pork tenderloin in a blueberry pinot noir reduction? Priorities, priorities — I just don’t have much of a sweet tooth. Well, I’ll just have to get some Pinot Noir and start experimenting. What a shame. I looked in my freezer and I found old flour and banana leaves. Needless to say, your freezer is more interesting than mine. Mmm…I’ve been in a muffin mood lately. These look so amazing. Yummy flavors and textures. Love the lemon curd too! YUM!!! I’d love one of those right now! i need to find that bottle of lemon curd! the 7th picture is so orgasmic! I love it! Wow! It was so tempting and looks really delicious. Thanks for sharing the recipes, I will try it this weekend and for sure, my kids will definitely love it too. It is great that we can get the personal loans and it opens up completely new possibilities.